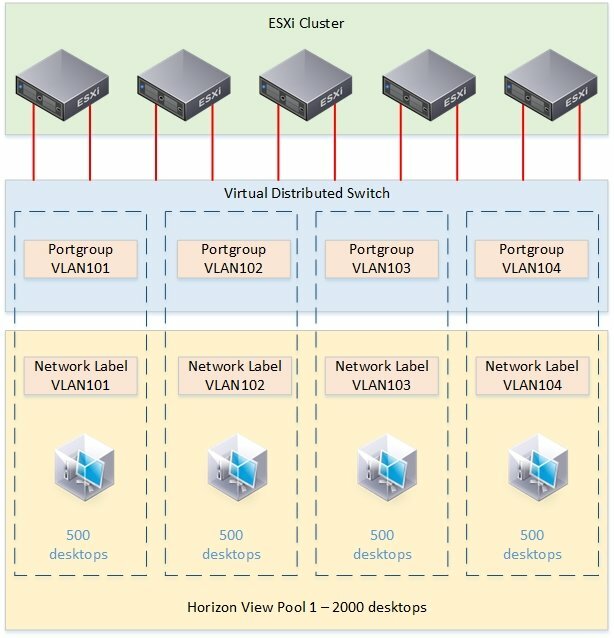 When implementing Horizon View Pools with a number of desktops that exceeds the limit of a single 24 bit subnet, it is very wise to think about properly designing and configure your network infrastructure for your VDI environment. Several best practice are available to do this and I will explain the one I am using in this post. But why? The answer is fairly simple. Imagine a Horizon View Environment with 2000 desktops. The easiest way of arranging network connectivity would be to create a massive subnet in which all of those desktops can be added. But when thinking of broadcast domains in a subnet of that size for instance, your network engineers won’t be happy. So creating smaller subnets with 500 desktops at max is definitely a lot better. In this case, when using 500 desktops per subnet, how would you configure Horizon View to be able to have more than 500 desktops per pool? Again, it’s fairly easy. You need to define multiple network labels per pool. Every Portgroup on the vSphere networking level gets a Network Label. And by using PowerCLI you are able to add those Network Labels to a pool. But more about that later. What’s very important from a management perspective, is that you are using vSphere Distributed Switches (vDS) if you would like to use network labels. If the vDS is properly configured, you will have to add the port groups just once on the vDS and they will be distributed to all of the hosts in the View Block. 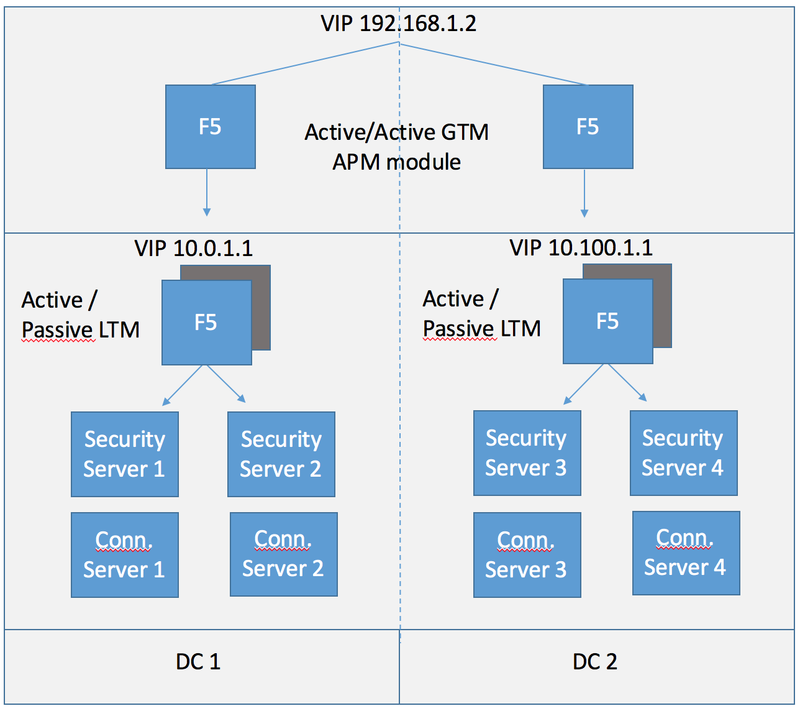 Before creating a pool for 2000 desktops, you will need port groups. Create 4 of them and call them VLAN101 – VLAN104. They will all be attached to a network with a 23 bit subnet (255.255.254.0). So prepare them on your routers/switches as well. So what’s next? Create the pool in which you want to add the Network Labels. Let’s say it is called Pool1. To add all the Network Labels to your pool, you will need PowerCLI on a connection server. There is a lot more in the dump, but these above are the most important ones. If you are using full clones, run Update-AutomaticPool instead. Ok, so your pool is now ready to provision 2000 desktops. What’s next? Your network should now be configured properly and behave like an enterprise level network suitable for thousands of desktops (from a functional perspective). Of course, you need a proper physical infrastructure that is suitable for a big number of desktops as well. 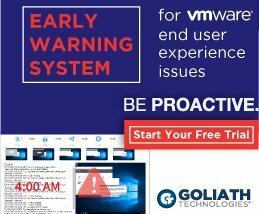 Previous PostVMworld 2015: EUC Will Rock You!